My version is a bit different, but it came from seriously lekker roots. The base flavour is mushroom (aka, plant-based beef) and the lentils are there to back up the whole meaty vibe. I used shitakes and portobellos (immune-boosting, folate, iron, rich-tasting) and lentils (more folate and iron, plus protein and again, that rich, beefy taste), more aromatic veg than you’ve eaten all week (celery, leek, onion, garlic) and flavourful, antioxidant-rich, immune boosting herbs (bay leaf, rosemary and thyme), and kombu, which ups the mineral count exponentially, adds umami and lowers the gas potential of the lentils. 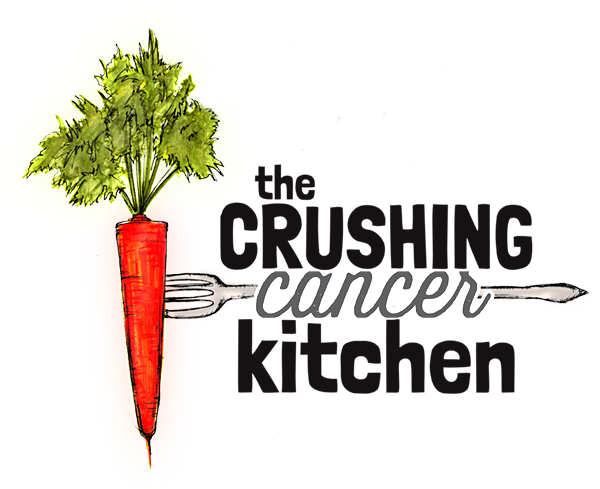 Also cauliflower, because it adds a nice, creamy texture, is a cancer-crushing cruciferous and why not. It can be replaced by rutabaga if you are boycotting it due to its recent infamous price hike. This soup is dark and broody and as comforting as a cozy blanket when you’re having one of those days when your toes won’t warm up. As much as I do believe there are times to brood, I think a little balance is always welcome. 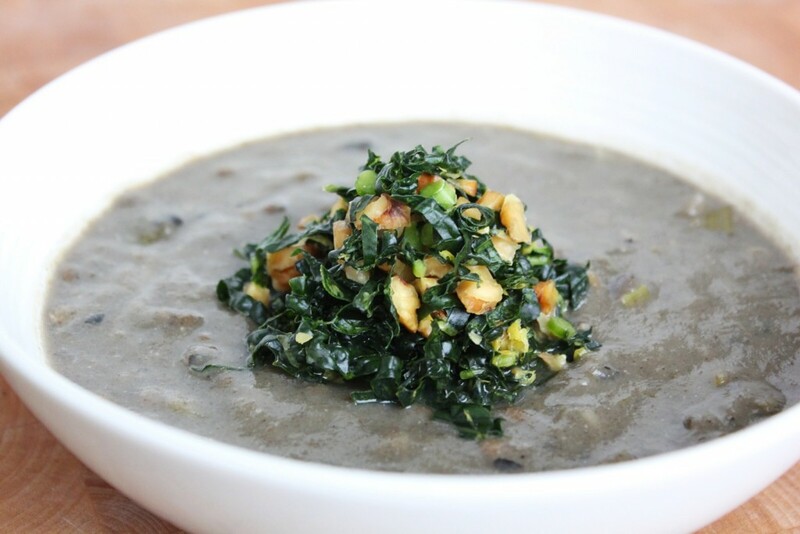 In terms of soup, we do this with some raw, thinly-sliced kale, lightly-toasted walnuts (a tasty homage to the Dutch pine nuts) and lots of bright and sunny, lemon juice and zest. 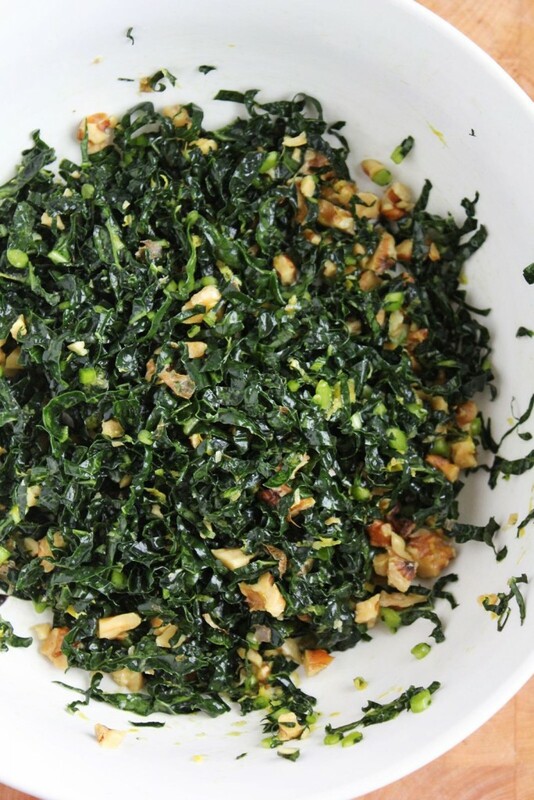 Warning: this tastes SO GOOD on its own, it might not even make it into your soup bowl soup. Have you ever had mushrooms with goat cheese? (we did it here with homemade vegan chevre). It’s the same principle, the acidity in the lemon juice really wakes up the dark, wintery flavours in the soup, and makes the whole meal experience a bit less….brown. I massaged the kale (squeeze it with my fingers to tenderize it), which does two things: makes it easier to digest properly by breaking down some of the cell walls (kind of like pre-chewing with your fingers) (weird, I know, but worth it), and it softens the kale, making it take on more of a cooked texture, while remaining raw and fresh to contrast the rich, simmered soup. I love the cooked and raw combo, which is what this dish has. 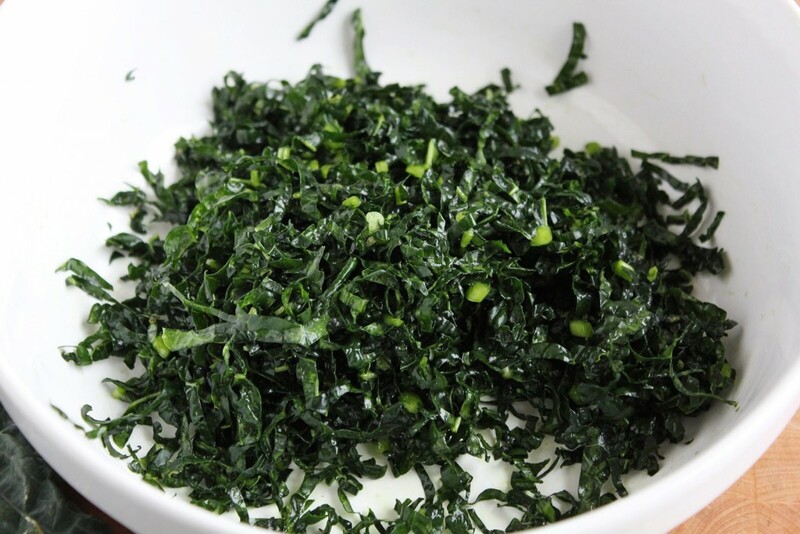 Add the kale ‘salad’ as a garnish/topper for the soup once it’s already in your bowl. 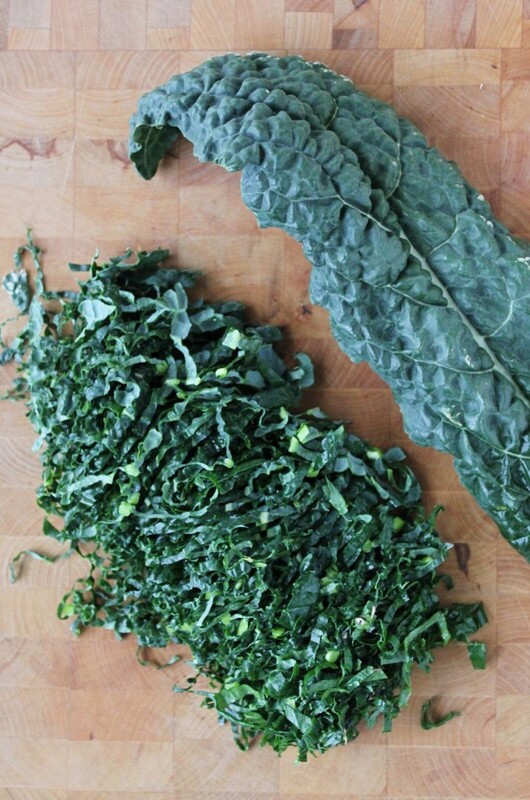 Add as much as you want, it’s actually a really great way to get your raw, leafy greens when icy cold morning smoothies seem a little too cold and wet. This soup freezes really well and what I usually recommend if you’re making soup for one or two is that you make the whole batch and leave out enough for one or two days and freeze the rest right away into one or two portion sizes. 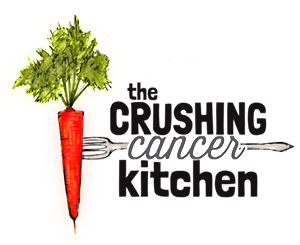 This way you won’t be eating it every day because you don’t want to waste it, but then you inevitably get sick of it (this especially applies if you’re going through cancer treatment). It also means you will have a surprise, effort-free meal waiting for you in your freezer, just one short thaw away. An even better idea? Plan with some friends to each make a different soup, (suggestions: Mexican Tomato & Black Bean, Smokey Split Pea, Curried Sweet Potato & Lentil, Mineral-rich Miso Soup, Tomato & Fennel), cool it all down, mason jar it up and get together to exchange them. Now you have a freezer full of variety with only a bit of effort from each of you (and an excuse to pull your raincoat out of the shower and hang out with your buddies). In a pot, on medium heat, melt the coconut oil and add the onion, leek, garlic, fresh herbs and sauté until translucent. 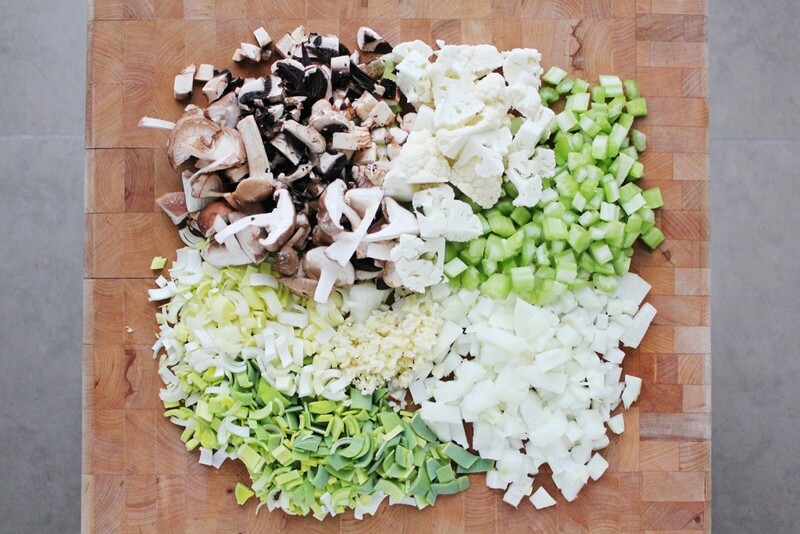 Add the mushrooms and cauliflower and continue to cook until soft. 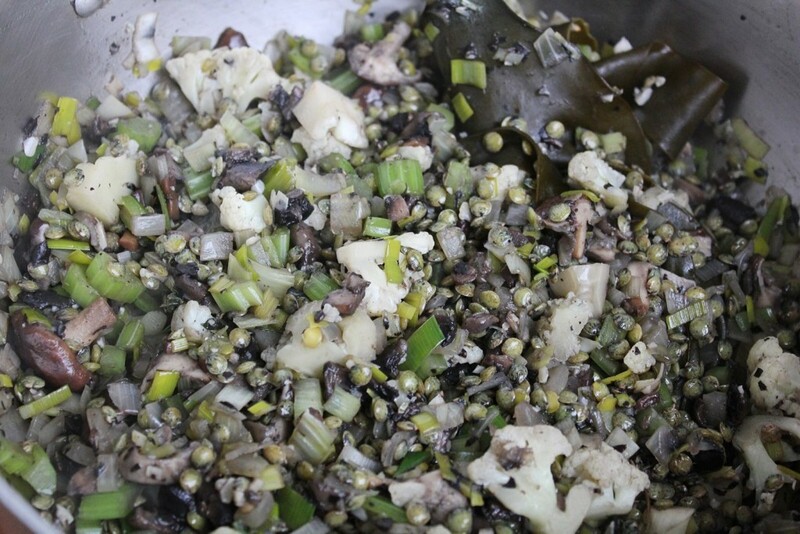 Add the water, lentils and kombu and bring to a simmer. Continue to simmer on a low for about 30 minutes to develop the flavours. Take half of the soup out and blend it in a blender until smooth (make sure you don't have the bay leaf or thyme or rosemary stems) and add it back into the pot. Alternately, pulse an immersion blender in the pot of soup until it smooths out some of the soup. 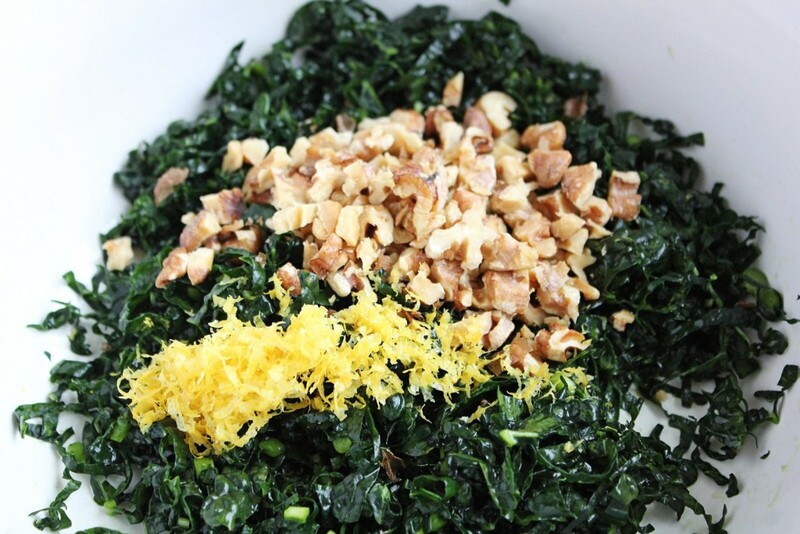 Serve in a bowl with a twist of lemony kale. You're going to love this, I'm so excited for you. *Safety note -it is safer to do the blending once the soup has cooled, just be careful. 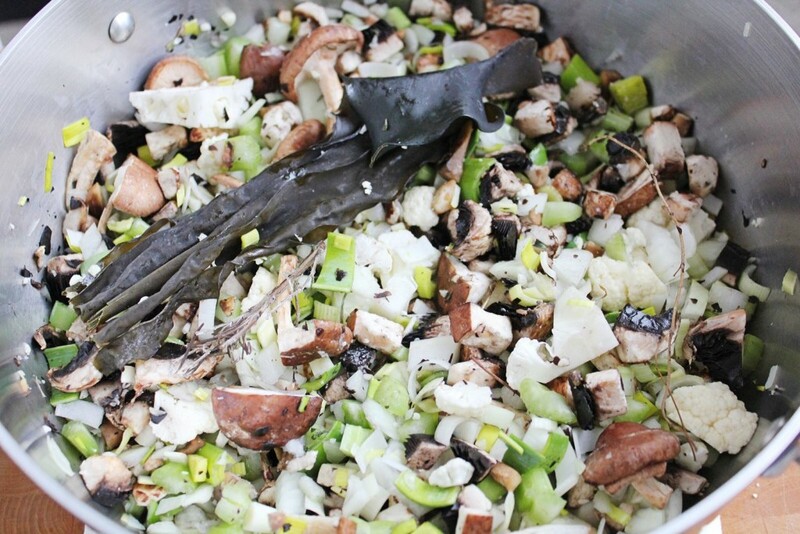 *Kombu note -I usually blend the kombu in with the part of the soup that I blend up. 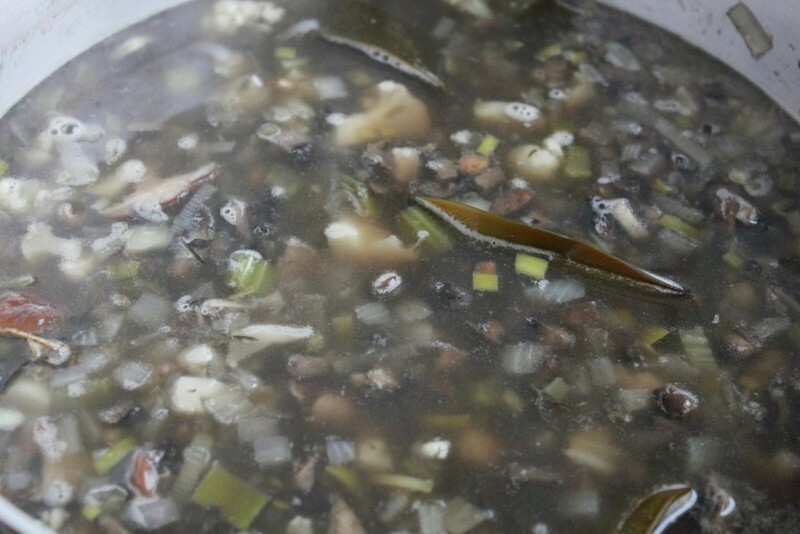 It is not something you will notice the taste of in this soup (it adds some umami) but it will thicken it in a gel-like way that is less noticeable when it is hot than when it is cold. It is a great way to get lots of minerals without trying very hard, give it a try! Transfer to a bowl, add the salt and massage and squeeze it until it becomes a bit wet and limp, almost as though it was cooked. Add the lemon juice, zest and walnuts and toss together. 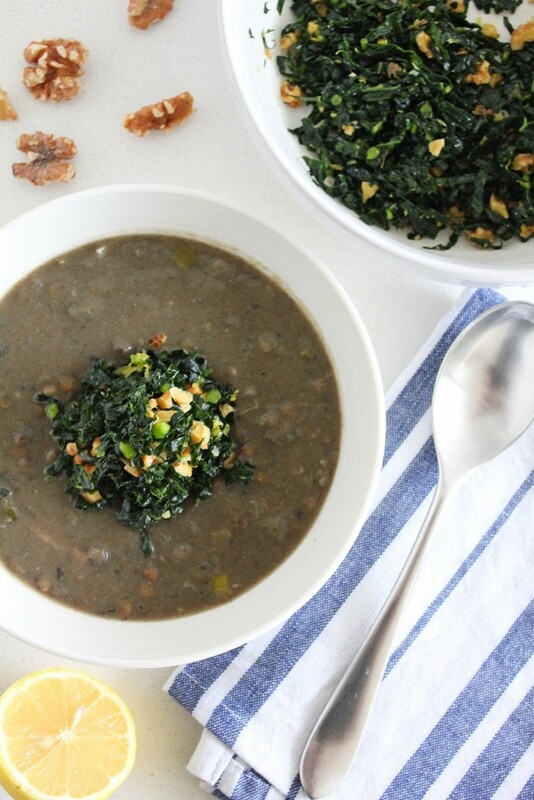 Top your bowl of soup off (or eat it like salad because it is SO GOOD! Thanks Brittany! Let me know what u think if u make it. This sounds delicious! Love me some soup! !